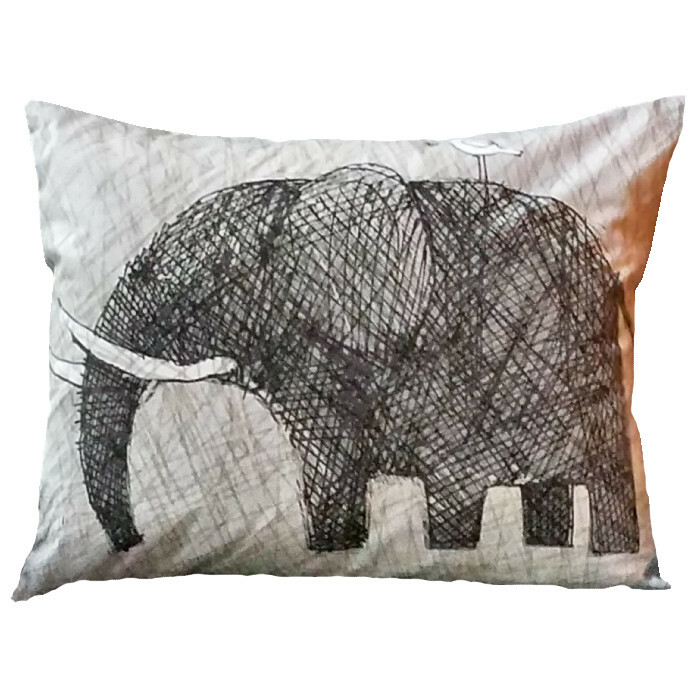 16×20 pillow of elephant on gray background with bird on its back. 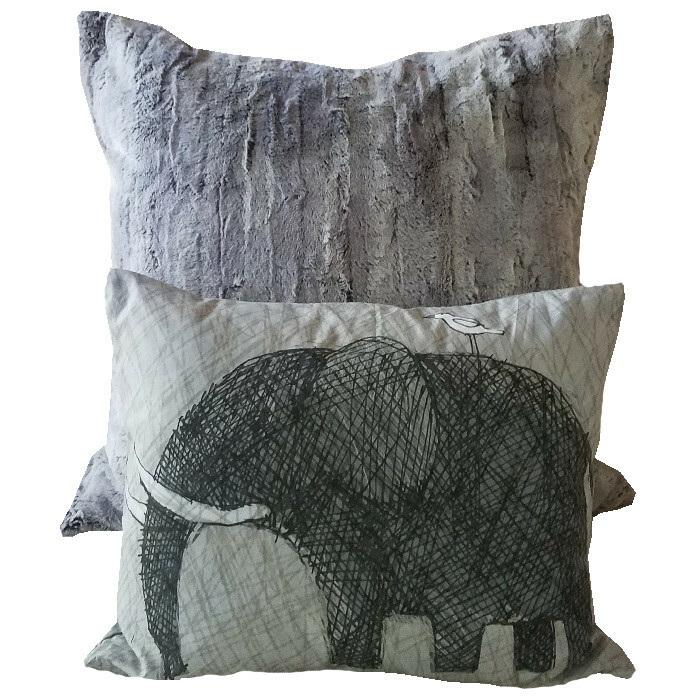 Ellie Phant –16×20 gray background, with bird on back. 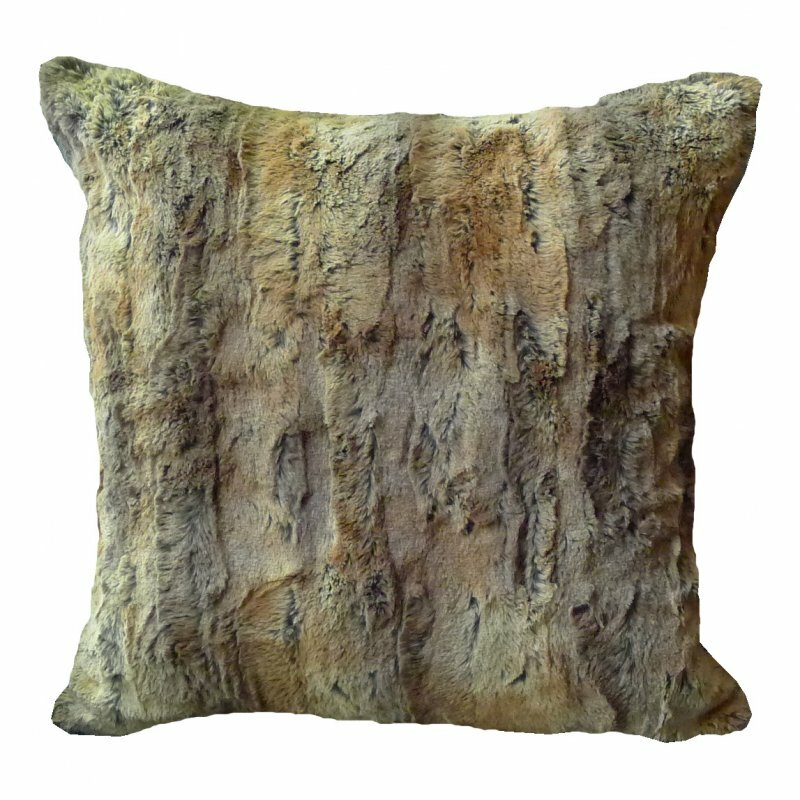 JLEuro – 26×26 Gray Faux Fox fur with suede back. 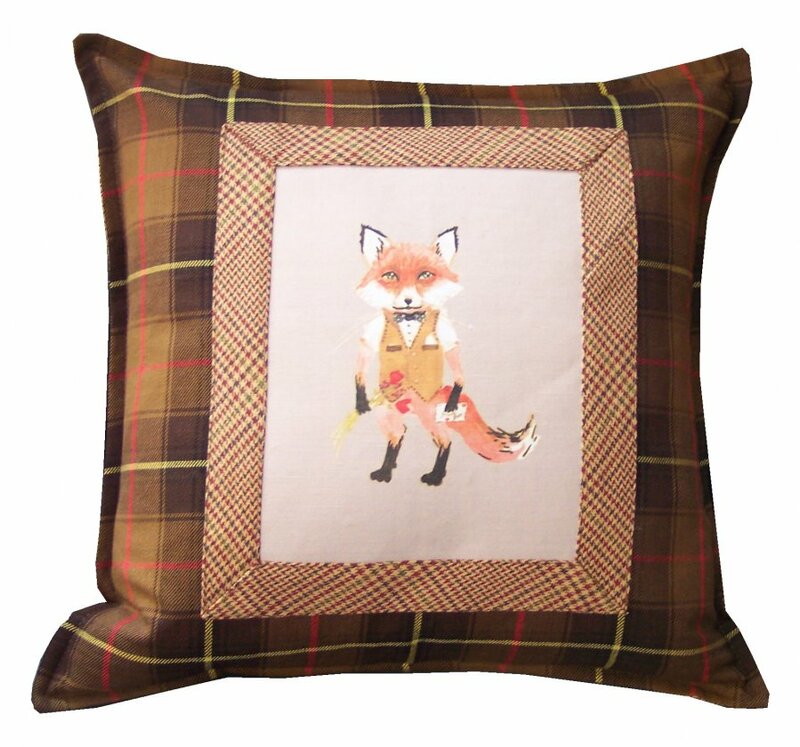 18×18 Mr. Fox center, custom fabric bordered in checks and tartan. 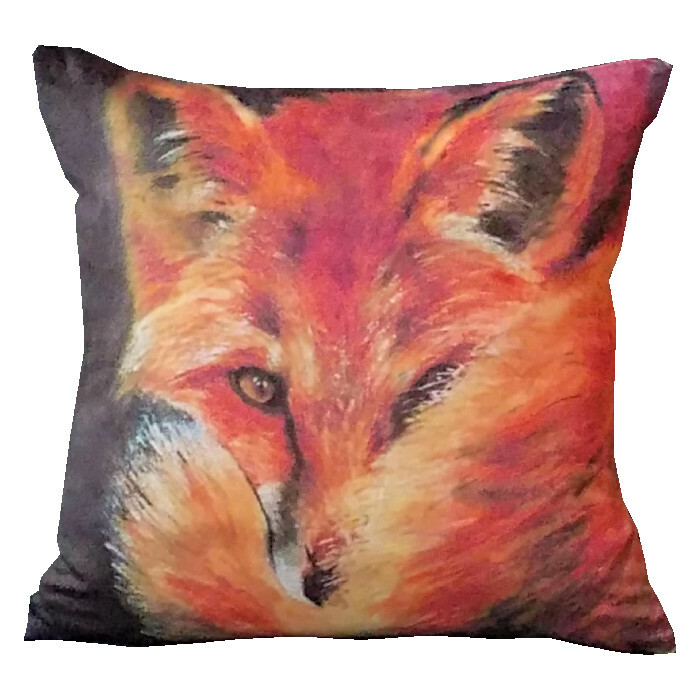 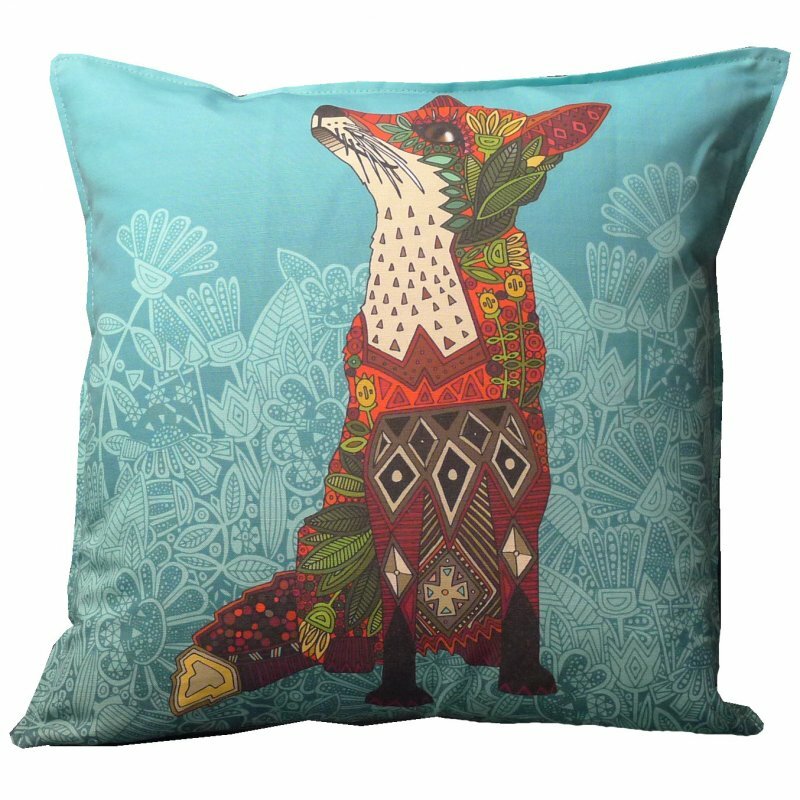 Foxface 18×18 painted fox face on minky, zipper closure, suede or velvet back, by Rachel Parker. 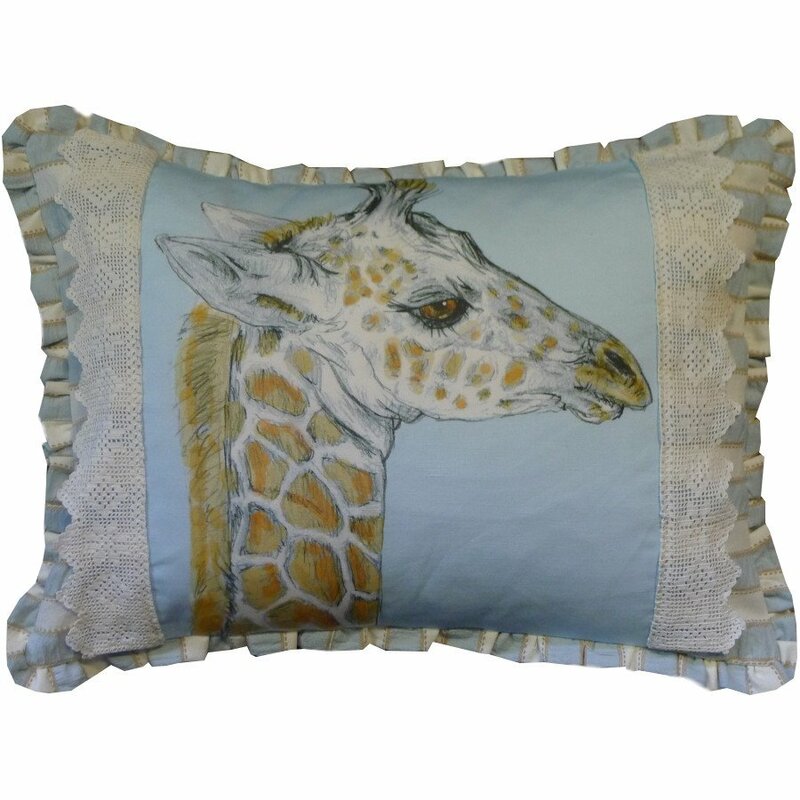 16×20 pillow with giraffe center, vintage lace and Sally Stripe. 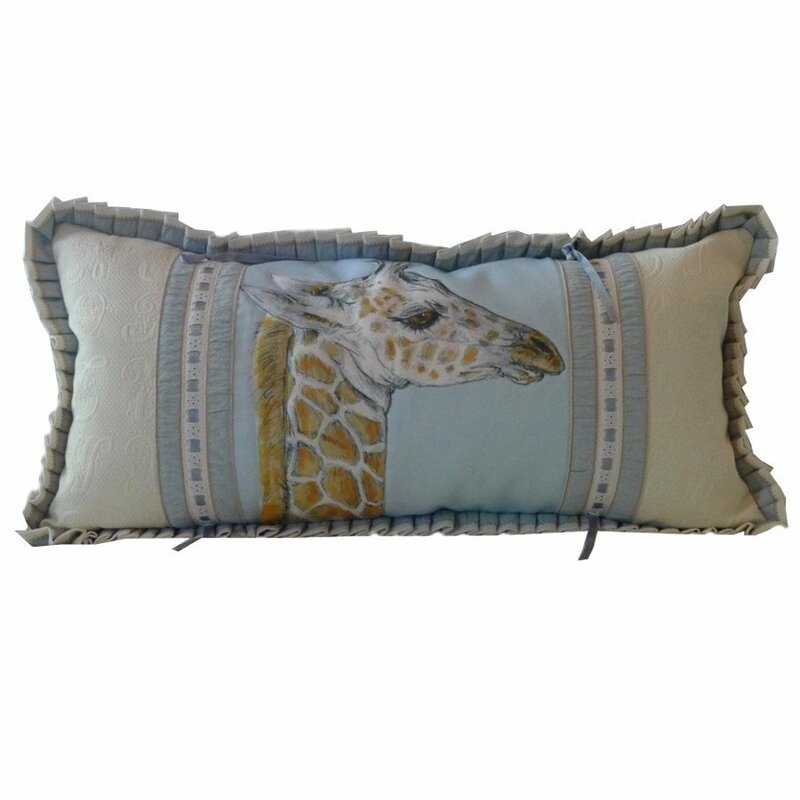 15×30 bolster with trapunto giraffe center, matelasse and lace trim. 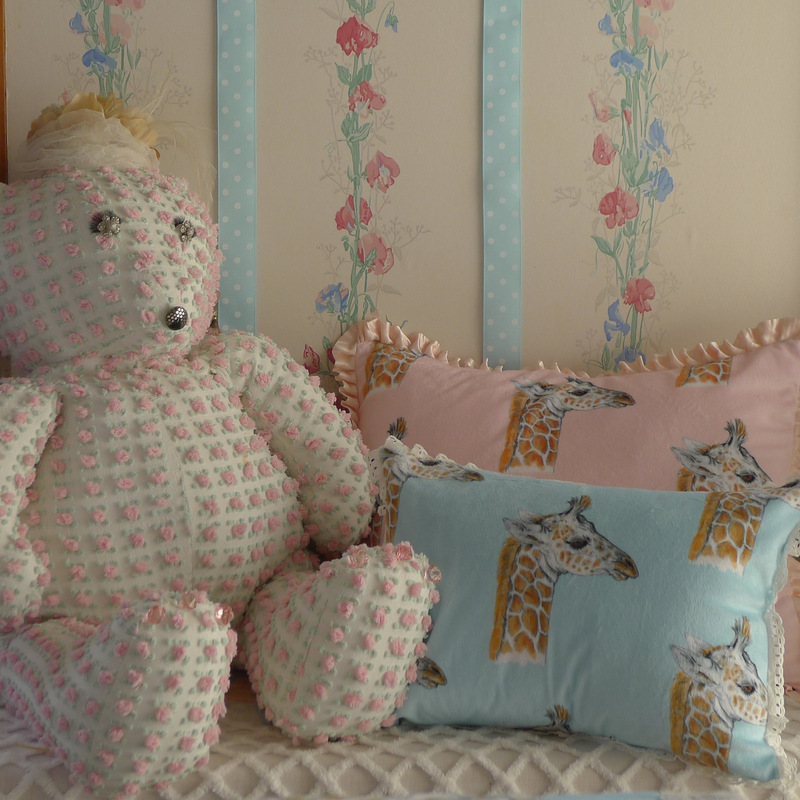 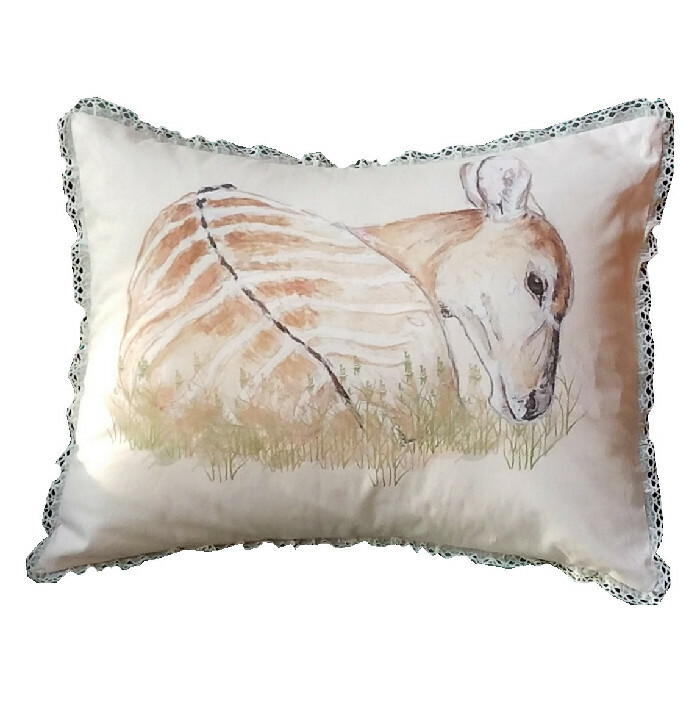 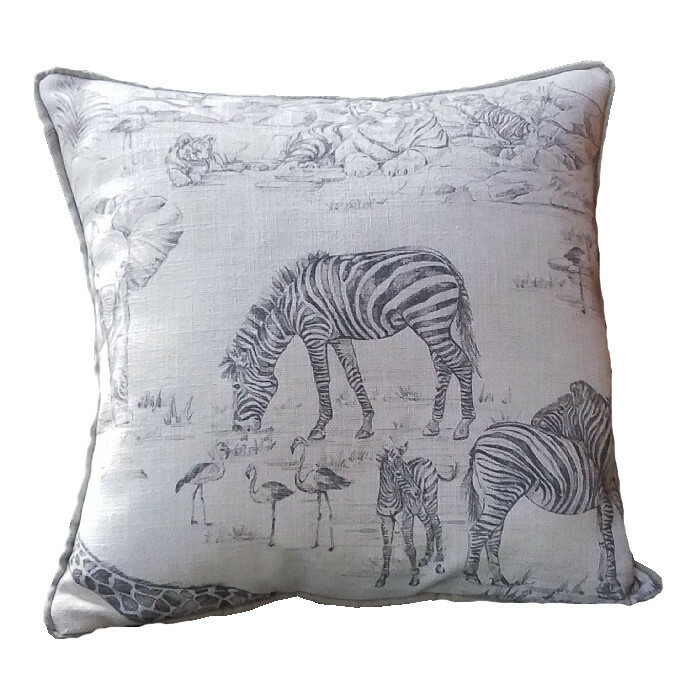 12×16 Minky giraffe pillow with ruffled edge and 16×20 Minky giraffe pillow with satin pleated trim. 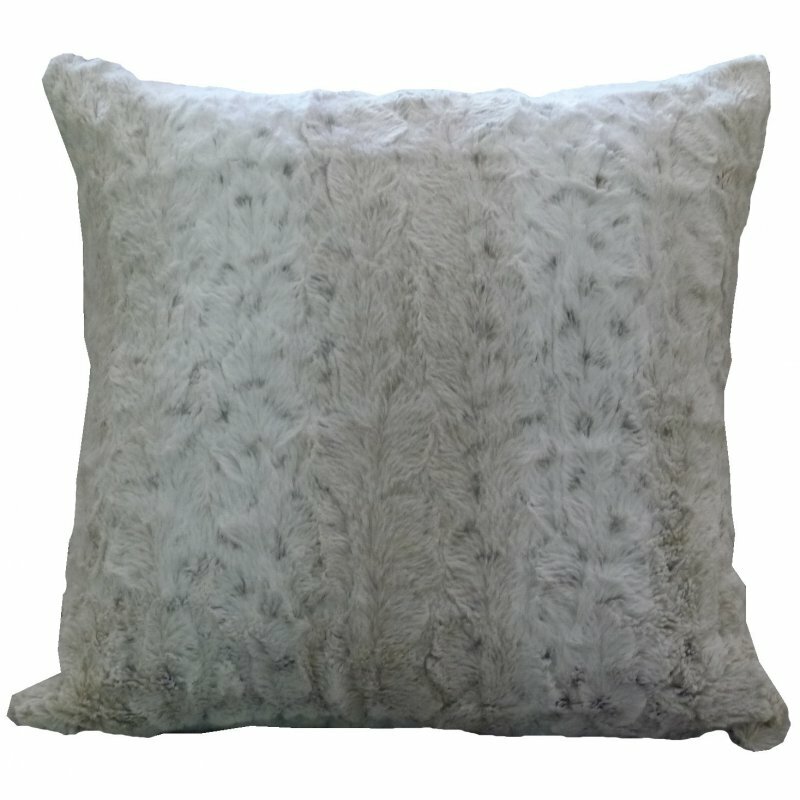 18×18 faux amber fox fur with suede back. 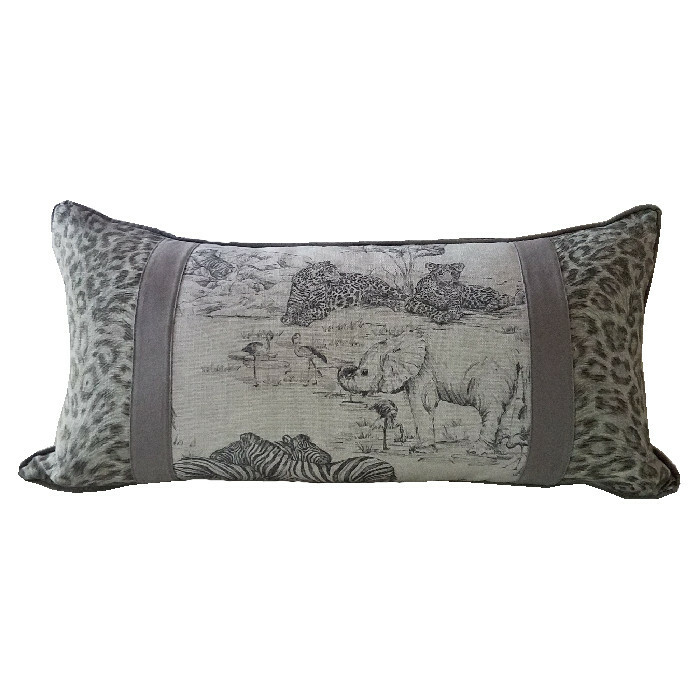 18×18 faux cheetah fur with suede back. 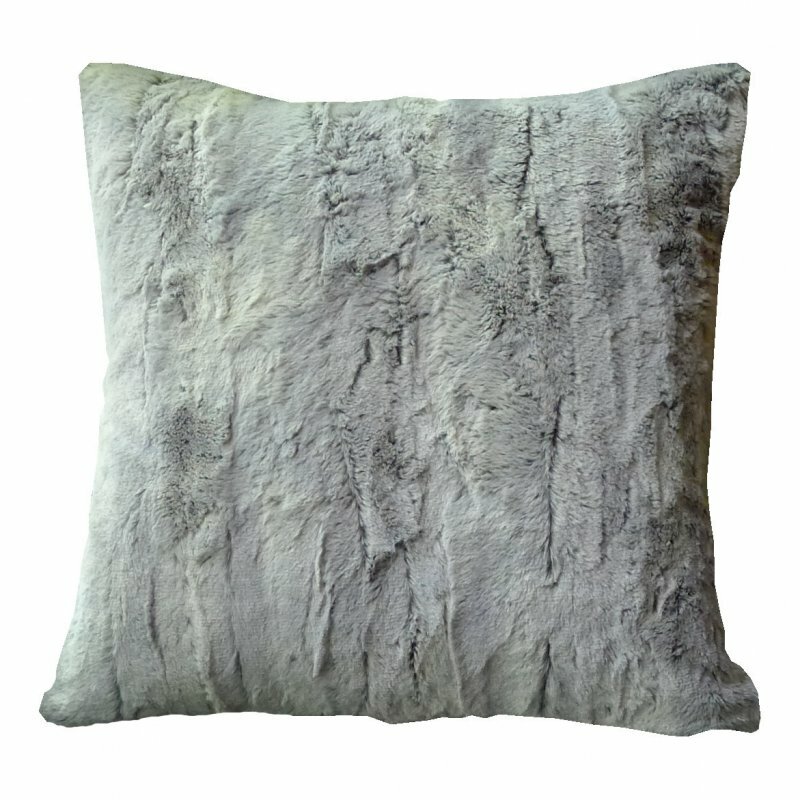 18×18 faux gray fox fur with suede back. 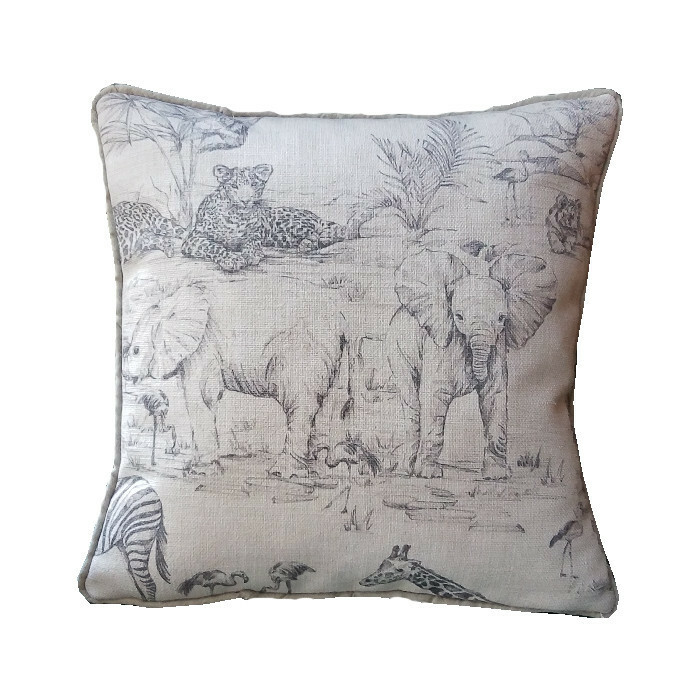 16×16 pillow of Jungle Love with suede back, cord trim. 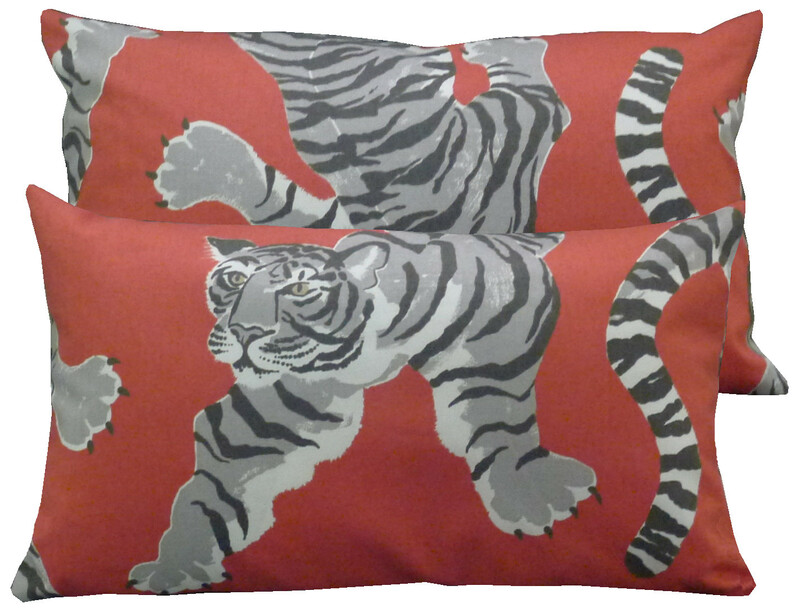 18×18 pillow of Jungle Love with suede back, cord trim. 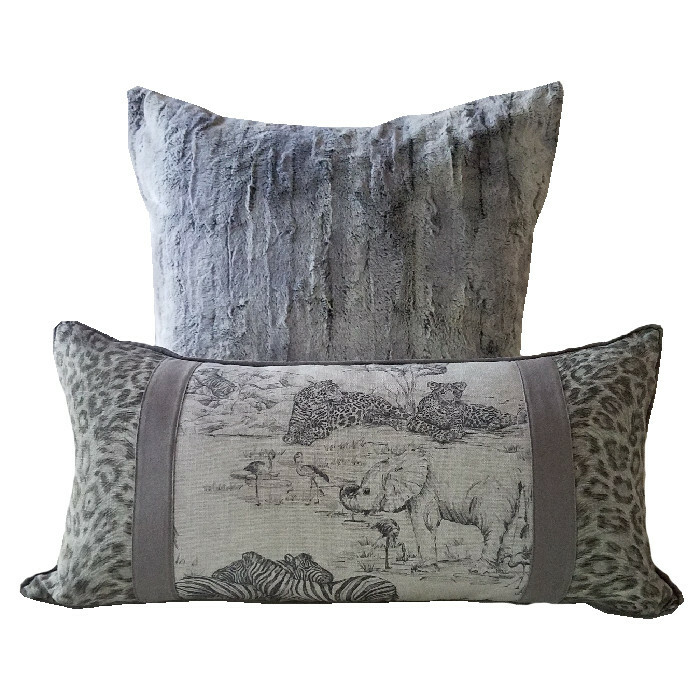 26×26 Euro of Faux Gray Fox fur and 15×30 bolster of Jungle Love trimmed with Jovan, suede backs. 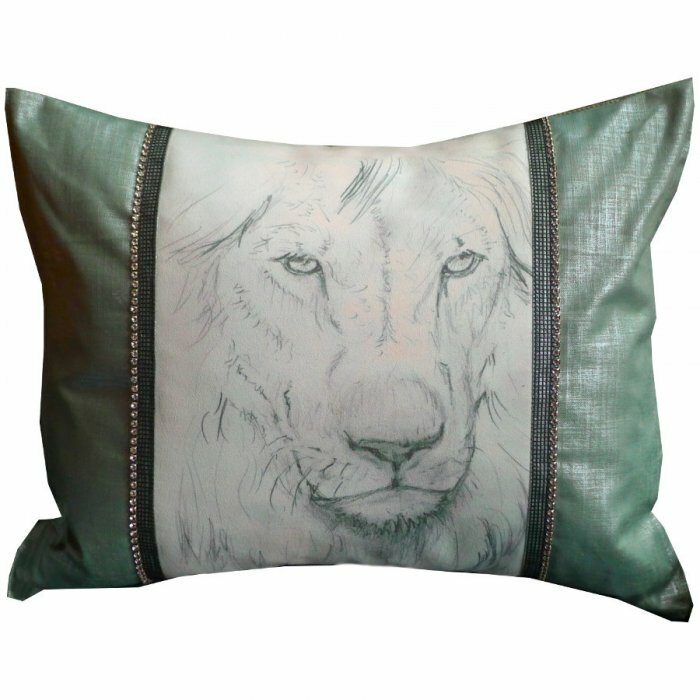 16×20 Lion sketch on suede with metallic linen and rhinestone trim. 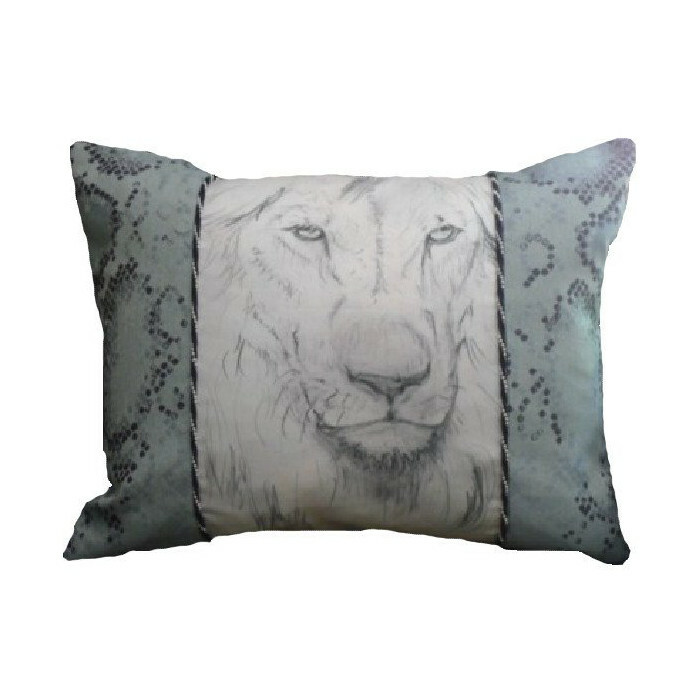 16×20 Lion sketch on suede, trimmed with Serpentina fabric and cord. 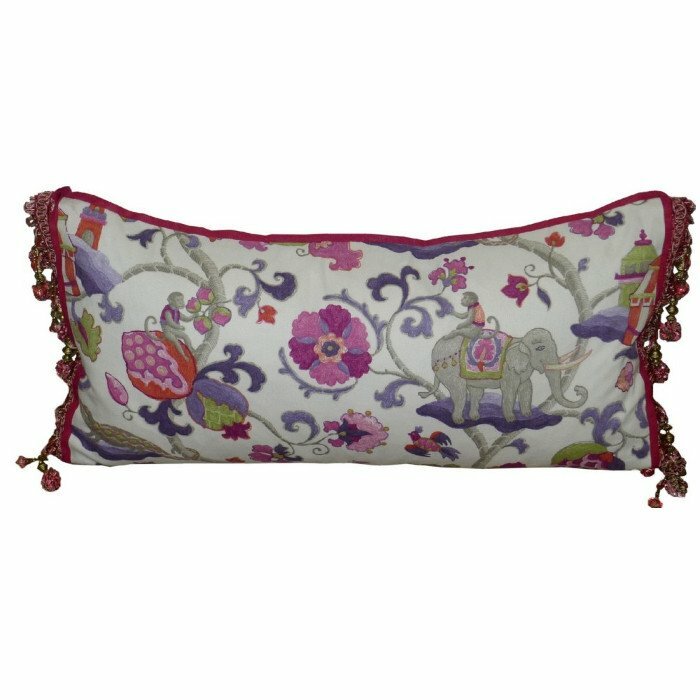 15×30 Sultan’s Walk bolster, narrow linen trim. 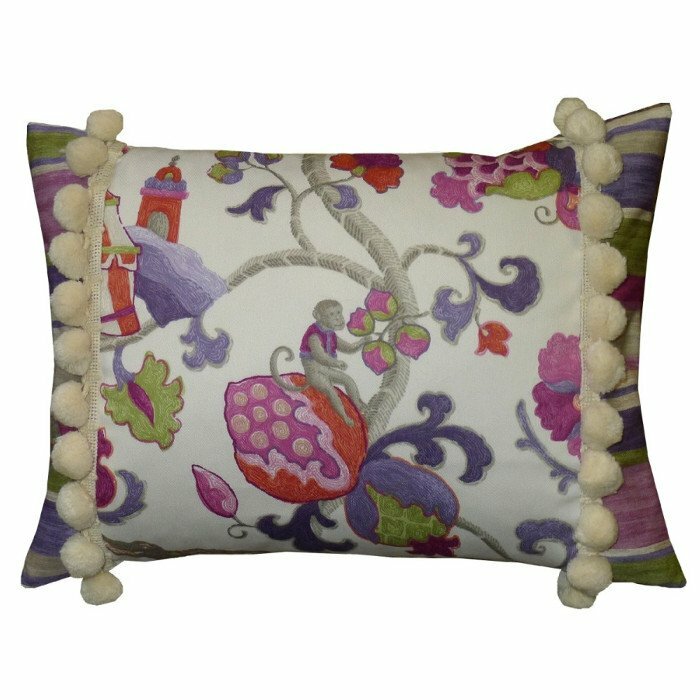 16×16 Sultan’s Walk pillow with pom pom trim. 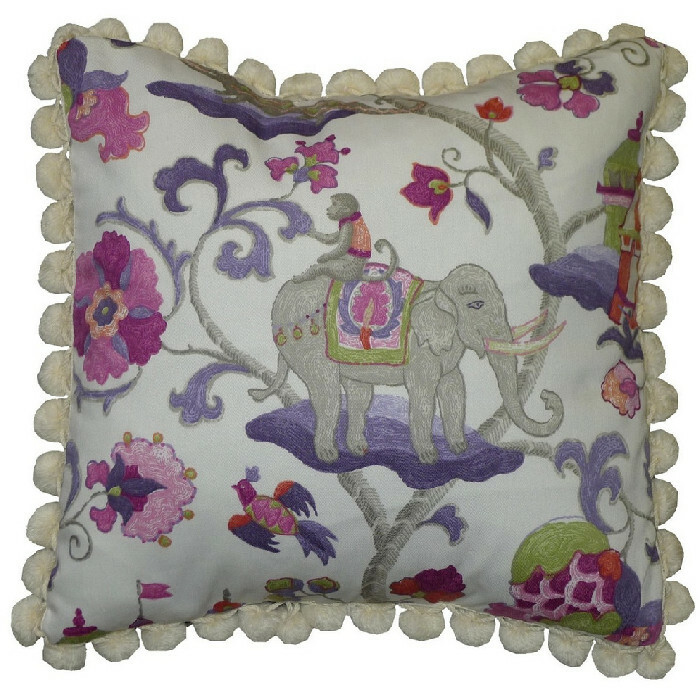 12×16 Sultan’s Walk pillow with stripe and pom pom trim. 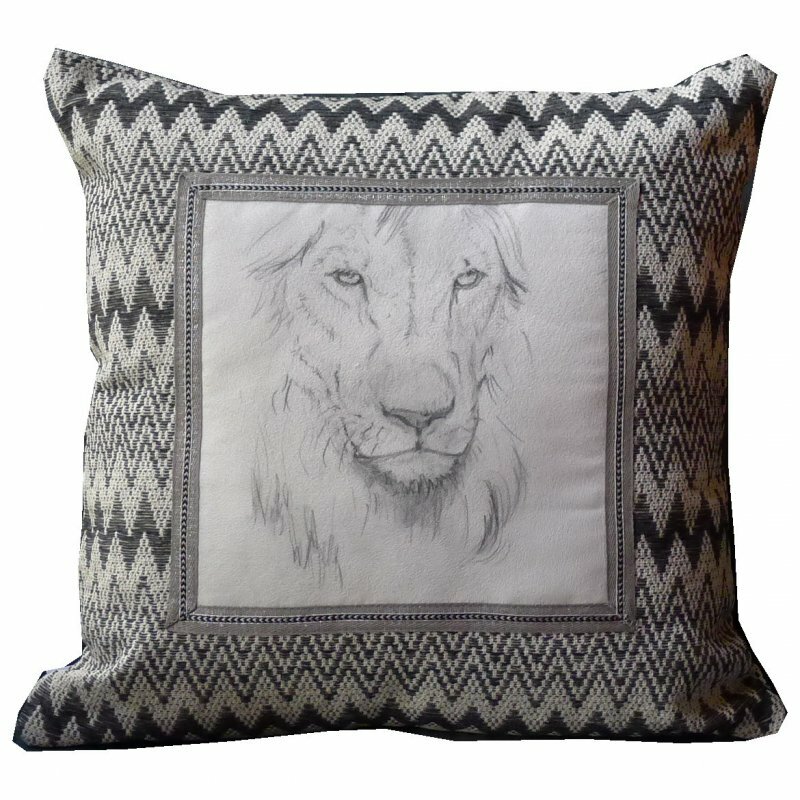 16×20 Nyala, original art work by Eclectic House. 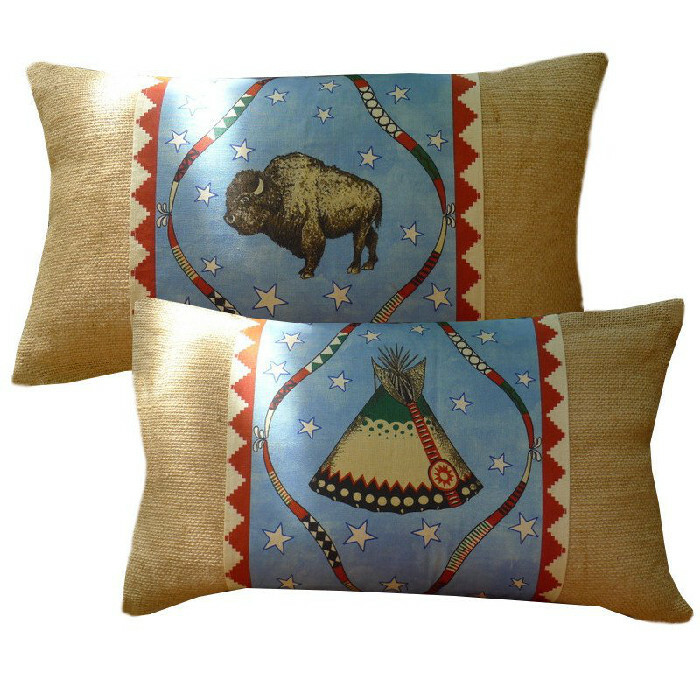 12×20 reversible burlap pillow with Buffalo/Tepee reversing obi. 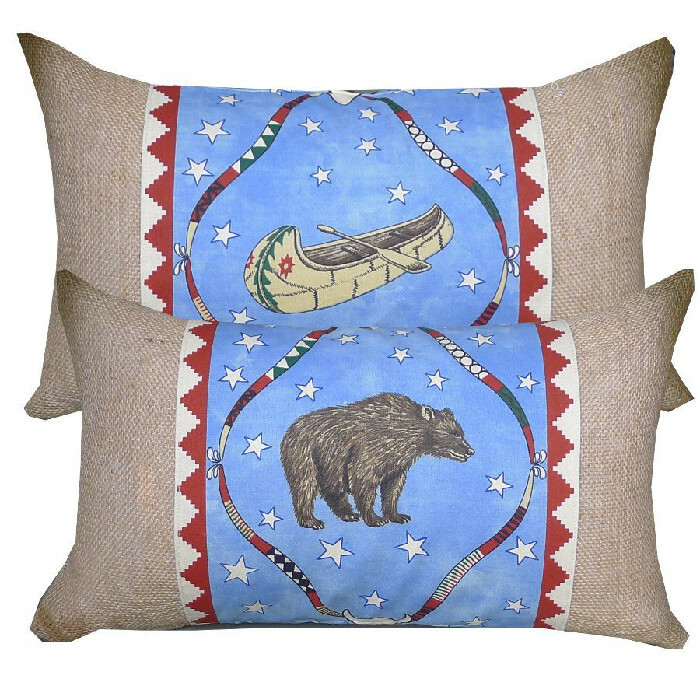 12×20 reversible burlap pillow with Bear/Canoe reversing obi. 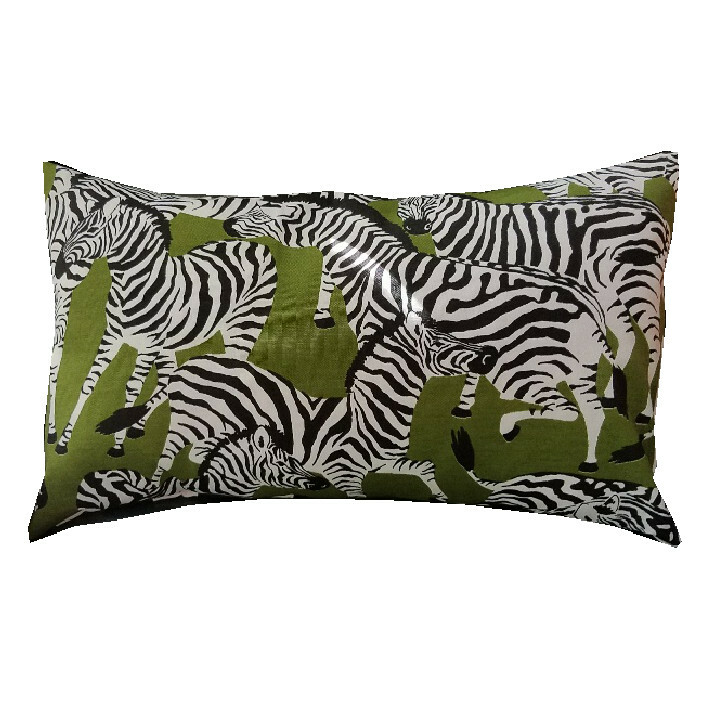 12×20 Zebra pillow of indoor/outdoor fabric. 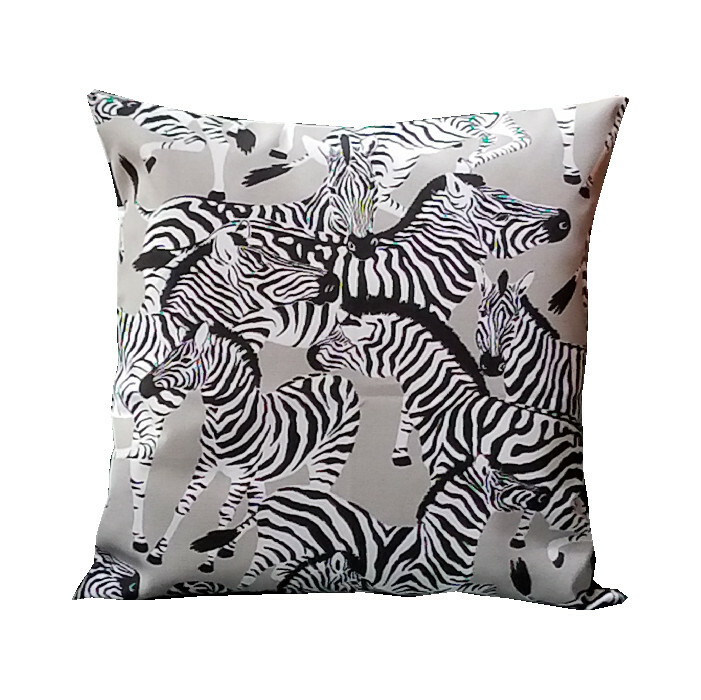 18×18 Zebra pillow of indoor/outdoor fabric.